Smoothie! Smoothie! Smoothie! Smoothie rocking everywhere!!! Yeah, that’s right! Smoothie Bowls are in and I am loving them. They are such a great healthy alternative for breakfast, lunch and snacks, maybe even dinner. 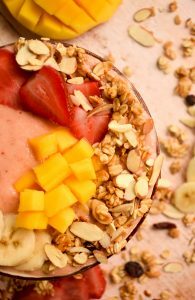 Whatever you choose this Strawberry Banana Mango Smoothie Bowl is a great option for low-calorie diets, paleo, vegan and in this case gluten-free. Honestly, this is my first smoothie bowl and I have to tell you how proud I am of myself to actually make this delicious bowl. OMG!!! It is soooo good. None of the fruits was too overpowering, I beleive the coconut milk gave it the perfect balance. Adding the toppings added the right amount of natural sweetness. I find that some people add honey or sugar/syrup but using the right toppings can just add to the smoothie in the most natural way. The granola gave it lost of texture and that added fiber. I usually have a smoothie before work or as my dinner at work, since I work a late shift. It is usually in a mason jar since that is much more convenient. After a meal my smoothie started to melt this it was literally 100 degrees outside. It was the perfect day for me to enjoy a smoothie. nevertheless, it was delicious and it filled me right up. 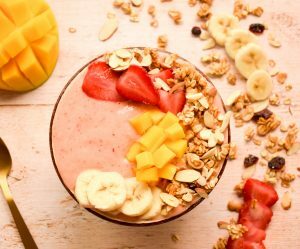 This Strawberry Banana Mango Smoothie Bowl is a delicious and healthy breakfast, snack or lunch. 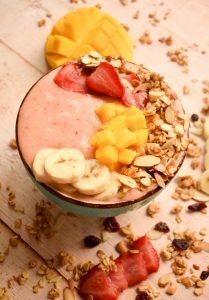 The blend of 3 different tasty fruits brings out a wonderful flavour that is also enhanced by the coconut milk. It is a perfect Vegan and Paleo recipe. Your heart will be happy! Cut strawberry, banana and mango into chunky pieces. Using a blender, blend all ingredients together until the consistency is smooth. 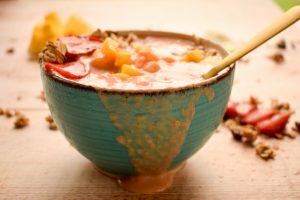 Pour smoothie in your bowl of choice and add toppings.